States, UN agencies, and civil society organizations are channelling unprecedented resources and energy towards the new post-2015 sustainable development agenda, which aims to lift billions out of poverty and deprivation while realizing human rights, protecting the environment and creating a more just and equitable world. 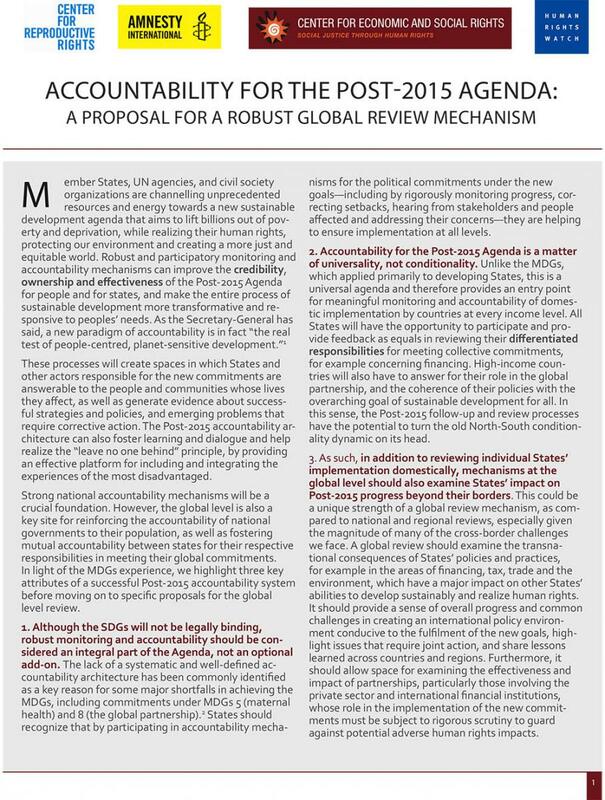 CESR has long argued that embedding meaningful accountability into the post-2015 agenda will be critical to ensure it stands any chance of achieving its goals and creating real, empowering change on the ground. As the Secretary-General has said, a new paradigm of accountability is in fact "the real test of people-centred, planet-sensitive development". In May 2015, one week of the intergovernmental negotiations will be dedicated to discussing what this new paradigm will look like, but already there are signs that ambition may be falling short of what is required. In advance of these negotiations, CESR - along with Amnesty International, the Center for Reproductive Rights and Human Rights Watch - has developed a proposal for a robust monitoring mechanism at the international level, with the human rights principles of transparency, participation, universality and accountability at its core. While this global mechanism should only represent one element of an integrated web of monitoring and accountability stretching up from the local level, it represents an important forum for strengthening accountability of national governments to their population, as well a fostering mutual accountability between States for their respective responsibilities in meeting global commitments. Under this system, States and other actors responsible for the SDGs will be answerable to the people and communities whose lives they affect, while the reviews will also generate evidence about successful strategies and policies, and emerging problems that require corrective action. Peer review. Building on the practices of the Universal Periodic Review (UPR) at the Human Rights Council, States would review each other's progress and submit targeted recommendations, in the spirit of mutual accountability and learning, with widespread participation and inputs from experts and civil society. Universality, not conditionality. Unlike the MDGs, which applied primarily to developing countries, all States will participate and provide feedback as equals in reviewing their differentiated responsibilities for meeting collective commitments, for example concerning financing. High-income countries will also have to answer for their role in the global partnership, and the coherence of their policies with the overarching goal of sustainable development for all. Cross-border accountability. As well as domestic implementation, this global-level mechanism should examine States' impact on post-2015 progress beyond their borders, for example in the areas of financing, tax, trade and the environment. Furthermore, it should allow space for rigorous scrutiny of the effectiveness and impact of partnerships, particularly those involving the private sector and international financial institutions, to guard against potential adverse human rights impacts. The broadest possible public participation. A people-centered sustainable development agenda must enable individuals, particularly those from the most marginalized communities, to participate in the reviews. There must be clear and accessible channels for people to contribute and share their experiences, including a system for civil society reports to be considered in parallel to those of States, and funding and other support for participation from national civil society and social movements. Recognizing the synergies with human rights review bodies. Just as human rights monitoring mechanisms can provide inspiration and lessons for monitoring the SDGS, States and the UN should ensure information and findings are shared systematically between these different accountability processes. Building better coordination will help to ensure that efforts to realize human rights and undertake sustainable, inclusive development are more coherent and that accountability is more holistic rather than piecemeal. Please see the full document for the detailed proposal. If your organization would like to endorse the proposal, please do so via this online form.